One of my favorite brands is REI. I am a hiking junky and can’t walk into one of those stores without dropping at least two hundred bucks every time. Of course, the main reason that I love REI is because they have quality products that I know will last years (if not decades) and I trust that they are a worthwhile investment. Another reason I love them is because their brand speaks to people like me. And part of the reason for that is because they treat their social media as more than just marketing. They’ve humanized the way they talk to their audience and turned it into a conversation. Traditional marketing, by nature, is always a little bit distant from who you are speaking to. The billboard you see is physically further away from you. You are reading an article in your favorite magazine and are disrupted with a full page ad before you can continue the story on the next page. You are browsing a cooking website for a recipe and see a retargeting ad for that perfume you were looking at yesterday. Social media is different. It’s interactive. It allows for the users to actually be a part of the conversation around your brand. They get to interact with the message you put out there and even share their own ideas for what that message should be. For example, right now REI is running a campaign for National Hammock Day, where they ask their audience to post photos of themselves in a hammock with their hashtag and will likely repost some of those photos on their feed. With social media, you as the brand are forced to give up some of the control because it’s no longer just you dictating the message, but rather you’re opening up a conversation with another person. Every time you post, think about the fact that you are talking specifically to one human. Scan through your posts. Are they all serious? Then you’re doing it wrong. 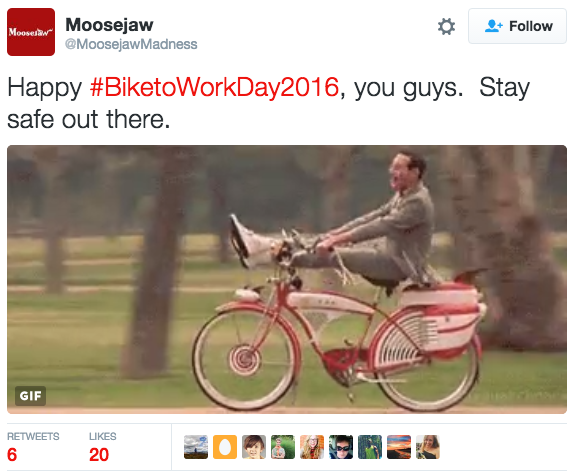 Moosejaw is another outdoor company that has quite the knack for wit and humor in their posts. They often times don’t even have to pair it with an image and the post will still get a ton of engagement. Make fun of yourself. Obviously, their audience is the healthy-outdoorsy-type, but it’s ok to laugh at yourself for it. This is easier said than done, but the first step to building trust among your followers is to take the time to be human in your responses to them. Even if you have a script that you are working off of, try to switch it up every time so that you don’t sound like a robot. Envision someone’s voice coming out of the other side of that computer and respond like you would to a friend that you cared about. Added tip — sign you name when you respond to a question on social so that the person on the other side is reminded that your brand is simple a group of humans coming together around a greater cause. Hendrick’s Gin is a fun account to follow. 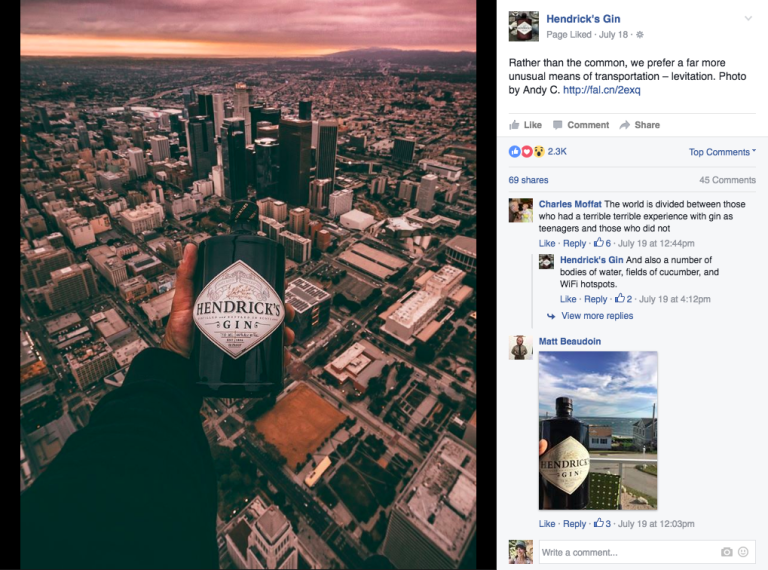 They post recipes and beautiful photos of product bottles in different locations and settings, but one thing that I really like about their feed is that you’ll often see their audience posting similar photos as a comment on the brand’s posts. 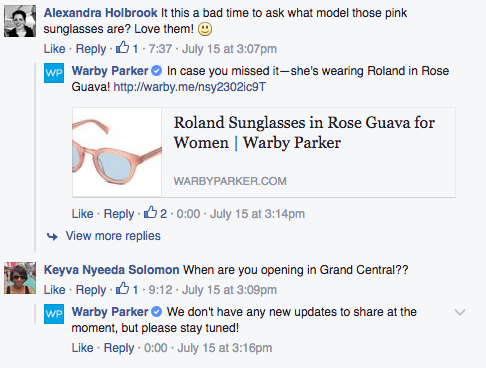 Each of their posts has dozens of comments, which is a good example of how they are letting their audience contribute to the conversation and be a part of shaping the voice of the brand. Feature a staff member in a Facebook live video or share a clip thanking a volunteer for their help. Take photos of the staff bowling outing. Share a story of why one of your employees chose your company. Take a picture of Ed’s Ninja Turtle birthday cake that his mom sent to the office. There are endless ways to celebrate the people who make up your company, which only reinforces the fact that you are human. Best Friends Animal Sanctuary often posts not only about the pets that they take in, but also about their employees and volunteers. Here is a video of one of the pups they took in and how their staff member Christine was able to help. Like I mentioned above, REI does a great job reposting their follower’s content. Here is a post celebrating the weekend (which everyone looks forward to!) as a repost of one of their followers. It’s possible that the hammock in the photo is a product that they sell, but the focus of the post is to promote the outdoors, not them. They are tying themselves with the cause of adventure rather than bringing attention to themselves specifically as a brand. But in order to enjoy adventures, you need good outdoor gear. See what they are doing there? This is an incredibly effective strategy, and hey, less work for you to find imagery to post when your audience is doing the legwork for you. I recognize that this is going to look different depending on the brand and how strict the company policies are, so be sure to check with your human resources and legal departments before posting something on social that you are unsure about. With that said, current and controversial news gets a lot of attention on social. This is something that your brand can capitalize on. 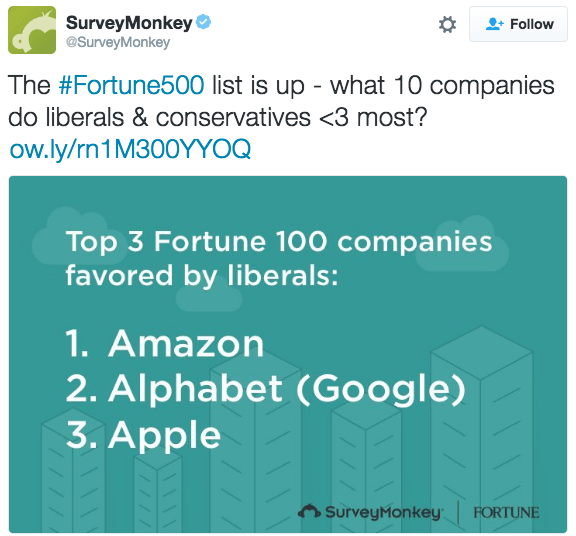 Survey Monkey conducted a study on how Americans felt about Fortune 100 companies and the results that they posted definitely stirred some conversation. 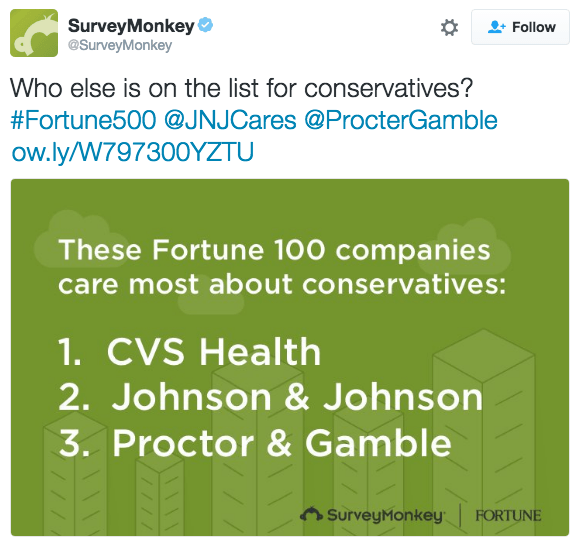 First of all, stats on social usually perform really well in the first place, so that was already setting Survey Monkey up for success. Secondly, they surveyed the differences between men and women as well as conservatives and liberals, which both can be heated debates. In general, they also post about politics, social issues, and of course hot news like Pokemon Go.